Guests had the opportunity to complimentary ride the balloons. Employees at the Summit East Technology Park were treated to an exclusive hot air balloon festival last weekend. The four-and-a-half-hour event gave guests the opportunity to ride balloons, enjoy dancing, face painting, and vendors while indulging in unlimited alcohol, followed by a nighttime firework show. The festivities were of no charge to employees and their families and only required guests to purchase food from the food trucks should they get hungry. 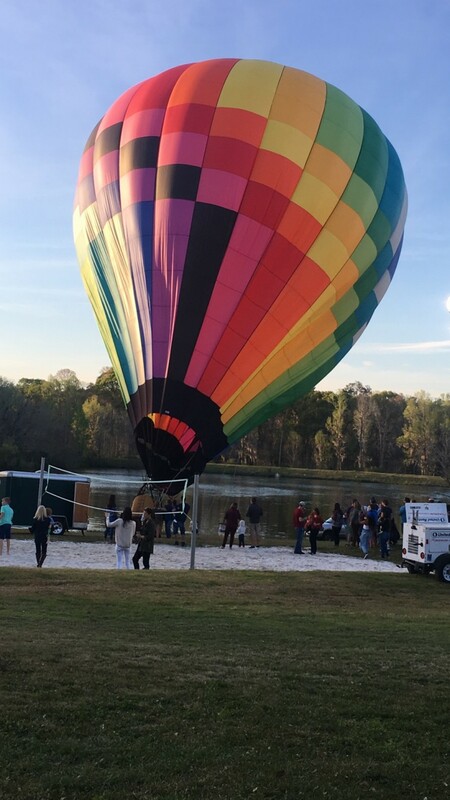 One event attendee, Jonathan Stewart, said despite it being his first time riding in a hot air balloon, his favorite part was the free wine. “I got to try all kinds of different types and it was nice to be able to drink outside,” he said. Julie Schulz, a Summit East Technology Park representative, said the event was designed with the employees in mind as a perk for working there. The office complex normally has an annual bonfire held between in early winter but due to inclement weather, they canceled it. The balloon festival was its substitute. Schulz said attendance was fair although not as large as the bonfires. Sandra Huggins, who has attended previous Summit East events, described the festival as “magical” and said she really enjoyed being able to attend the event with her spouse and children. Deanna Wilson, who found out about the event through a friend, was also appreciative of the universal entertainment. Although most hot air balloon festivals are known for having a plethora of balloons, what made this festival unique is that it had two balloons available for rides. It provided an intimate experience for the small-scale crowd. What the event had in common with it’s counterparts was the atmosphere and entertainment it granted, delighting ballooning enthusiasts of all ages. The opportunity to enjoy a complimentary ride in a hot air balloon afforded some people a chance to check off their bucket list goals, fulfill their Wizard of Oz fantasies and push past their limits like in Disney Pixar’s “Up.” The night was concluded with a 15-minute fireworks display, lighting up the sky to the theme of the Star Wars’ soundtrack. adding a spectacular touch as a finale. Schulz said they will decide on a yearly basis whether or not this is something they will do again.